The week after "Babes of the Wood," the cartoonist seems to have been utterly incapable of resisting temptation himself. 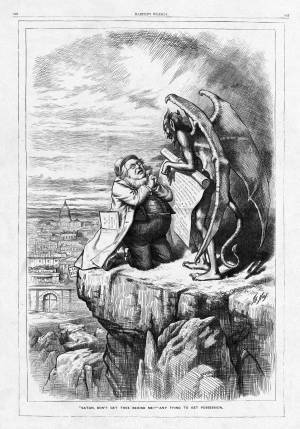 In this cartoon, the pious Greeley is shown in an brutal burlesque of Jesus' temptation on the mountain. The New York Tribune editor is begging abjectly for the support of the Democratic Devil to help him enter the governmental "Kingdom of Washington" spread out behind him. Nast's huge, over-wrought, two-page spread is itself modeled after an comparatively ethereal image of the same subject by Gustave Dore from his 1866 Holy Bible (Vol. II, p.171).